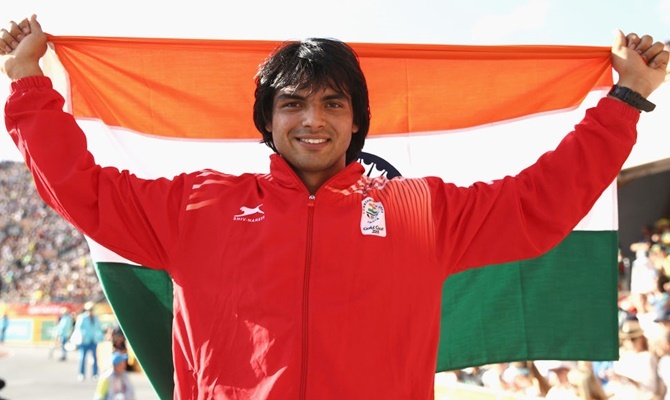 Star javelin thrower Neeraj Chopra was named the Indian contingent's flag-bearer for the Asian Games opening ceremony to be held on August 18 in Jakarta. Indian Olympic Association (IOA) president Narinder Batra made the announcement, on Friday, during the send-off ceremony organised for the contingent. The 20-year-old Neeraj is the reigning Commonwealth Games champion and junior world record holder in javelin. He is one of the bright gold medal prospects in this edition of the Asian Games. "I am thrilled to be chosen as flag bearer of the Asian Games. It is a huge honour to be leading the Indian contingent in such a big event," Neeraj said from his training base in Finland. "I did not know this as I was not told earlier about this. This is going to be my first (to be a flag bearer) and it's happening in the Asian Games," he added. Neeraj had won a gold medal in the Asian Athletic championships in 2017 with a throw of 85.23 meters. He had also bagged a gold in the 2016 IAAF World U-20 Championships in Bydgoszcz, Poland. The reigning Asian champion will, however, have to change his earlier plan of reaching Jakarta a few days before the start of his event on August 27. But he is happy to be on time for the opening ceremony. "My javelin final is on August 27 but now I have to be there in Jakarta before August 18 when the opening ceremony is being held. But it is not an issue and I am happy," he said. Athletics Federation of India Secretary C K Valson said Neeraj will reach Jakarta on August 17. "He will be in Jakarta on August 17 for the opening ceremony next day. After him, the first Indian athletics contingent will land in Jakarta on August 21," Valson said. Track and field events start on August 25 in the Asian Games. India had won 57 medals, comprising 11 gold, 10 silver and 36 bronze medals in the previous edition at Incheon, South Korea. The IOA has named a contingent of 572 athletes for the Asian Games this time.